As a junior in college, my goal for this semester was to exceed my limit and take on every opportunity that presented itself. I was excited and yet also nervous because it would push me to meet my goals and achieve what I really wanted: Success. Fulfillment. A sense of accomplishment. Through a very hectic and busy semester jumping in to see what I was made of, I discovered something about myself. I transferred to the University of Bridgeport (UB) to major in Religion and Politics with a concentration in East Asian studies. Thanks to the support of my dean, Dr. Thomas Ward, I’ve been able to do much more than I ever thought I could. I’ve taken master’s level classes and, even though I never thought I would study abroad, I earned a full scholarship to study Korean and North Korean Politics and Culture this July in Seoul, South Korea. Beyond academics, I also took on an internship with the Collegiate Association for the Research of Principles (CARP) in New York City, got hired as a UB Student Ambassador, and represented my university at the National Model United Nations (NMUN) conference at the end of March. It sounds like a lot but I figured these were all things I was excited about and wanted to do. My challenge was to stay focused and committed to my goal through the ups and downs of the semester. Through these accomplishments, I have much to be proud of and am grateful I took the leap out of my comfort zone. However, it wasn’t all easy. In pushing myself, I also noticed areas where I fell short, where I lacked confidence, and where there was definitely room to grow. I found that no matter the shortcomings, there were lessons to be learned. One of my most eye-opening experiencesthis year was attending the National Model United Nations Conference. 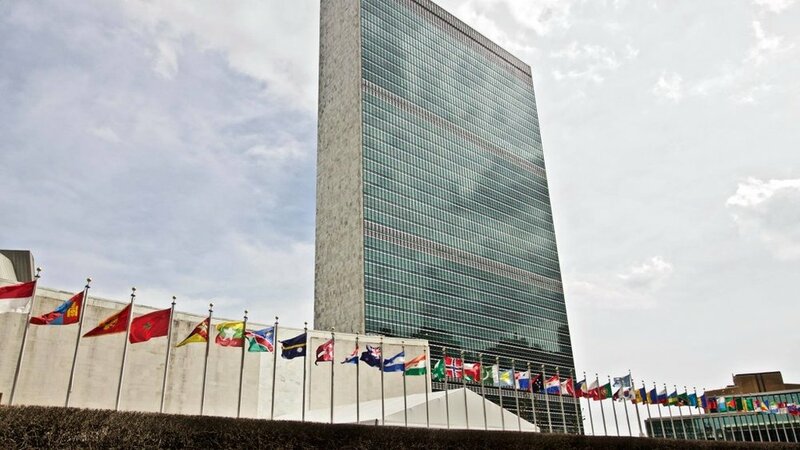 Thousands of college students from hundreds of universities across the globe traveled to New York City to take part in this conference each year, as representatives of the member states of the United Nations in the different UN committees. My university represented Brunei Darussalam, a small Asian country next to Malaysia,and I served as a delegate for the United Nations Conference on Housing and Sustainable Urban Development (Habitat III), a new committee of the UN that will meet to discuss safe and environmentally-friendly city building. Delegates had to work together to write, edit, and vote on resolutions that would be accepted by the whole committee. Some realities about the conference became clear to me right away. It’s not about what you know. It’s about what you do. Our squad–the Pacific Islands represent! Even though we were all supposed to be representing a country, including its real-life partnerships, I quickly realized that the country’s name on someone’s badge was not enough to make them an ally. Being genuine, diplomatic, and self-motivated to bring people together made them an ally. By all rights, I “should” have worked most closely with fellow strong Southeast Asian nations. However, the delegates that stood out to me (because of their openness) came from micro island nations of the Pacific–Kiribati, Tuvalu, Marshall Islands and others. As a team, we could do more as a strong coalition because of our harmony and ability to listen. Don’t just step out of your comfort zone–Take a running leap! If there was one mistake I made during the conference, it was not taking every opportunity to put myself out there. During each session, between bouts of frantic paper-writing, each committee listened to their peers give small speeches (60-90 seconds long) about their country’s viewpoints, goals, and actions so far in the conference. That was a big way that people could publicize their work and gain allies. To speak, each delegation had to ask to be added to the “speaker’s list” by sending a note to the chair. Not once did I ask to be added to the list. I was anxious about not being prepared enough to speak eloquently before the committee. That fear ended up holding me back. I realized that although I was committed to take part in this conference, I wasn’t fully committed to getting the most out of the experience. Next time, I’ll be sure to take the risk and learn from whatever comes of it. You’re a kingpin so make it count. Leading up to the conference, I felt that I might get lost in the crowd among hundreds of schools and thousands of other students. I wondered to myself, “What would set me apart as valuable and important compared to another delegation?” However, being there, I realized the power of a single voice. As we were putting in the final edits to our working paper, my group of scrappy island nations were tasked to merge our work with that of two other smaller groups. Normally, that’s not a big deal. It’s easy if we work together. However, that merger nearly ruined everything. The leader of one merger group decided that they would be the de facto leader of everyone. All final edits would go through her. Others wanted to divide and conquer based on strengths (editing, making clarifications, etc. ), which had worked efficiently throughout the conference, but she would not listen. She offended another delegation, who even reported her. The last few hours were almost completely wasted by the power of a single selfish voice. In the face of that drama, I found my voice. As time was running out, I realized that the fight with this girl had displaced the reason why we were all there. Everyone’s hard work was on the line, and instead of continuing to argue against her, I advocated for working with her. In the end, our working paper was accepted and we could celebrate our shared success rather than be left feeling bitter over our disagreements. Be courageous out there and remember the big picture. If you show a commitment to the higher goals, you can build connections wherever you go. Older PostMeet CARP’s New Intern!